A simple pushbutton operated LED is used to test this. I only needed a few parts (which I had on hand), a voltmeter, and David Jones’ µCurrent (see sidebar) to verify I’m drawing very little current when I’ve turned the system off. Figure 1 shows the test circuit. You can see that the processor is permanently connected to the battery. The power switch is between the battery and one of the processor input pins. Figure 2 shows the prototyped circuit (with a few extras) connected to my current measuring system. The meter shows that in sleep mode this circuit draws 16.8 nA. The code for the power switch is written using the CCS PIC® C compiler, and the entire file can be obtained from this article's download link. Portions are duplicated here to explain how the switch works. The user presses the power button. The processor detects the change from low to high on a pin and wakes up. The processor goes on to initialize itself and continues to perform its main task which, in this case, is to turn on an LED. The main processing loop checks for a button press of a certain length of time (two seconds, in this case). This can be with the same button that turned the system on. Once that button press has been detected, the processor turns off all peripherals, sets up the conditions to detect the next “power on” event, and goes to sleep. Let’s look a little closer at how this happens. The system doesn’t start out in sleep mode. When it first gets turned on (for example, when we put in new batteries), we don’t want it to interpret this as a start signal. Fortunately, the processor can determine how it got started. There can be several reasons for a processor waking up; the two we are concerned with are NORMAL_POWER_UP and RESET_INSTRUCTION. When we connect the battery for the first time or replace the batteries, the processor wakes up and detects a NORMAL_POWER_UP as the reason. The code then tells it to go to sleep since we only want it to turn on after a reset that was initiated by a button press. All the instructions up to enable_interrupts() are designed to eliminate any current leakage through the processor, and to turn off power to peripheral devices. The specific instructions will depend on the internal and external peripherals, special features of the processor, and so on. The spec sheet has all the information you need. However, you may need help from user forums and other documentation to make sense of it, and some of it is just trial and error. For example, I had a serial connection I was using for debugging, and I just couldn’t get the current draw near to what I was expecting. Once I disconnected the serial cable, all was fine. So, for those applications that have a serial connection built in, you need to add additional commands to be sure it doesn’t draw power from the processor during sleep mode. The enable_interrupts() instruction tells the system which pin will be used to wake it up, and the next instruction puts it to sleep. When the selected pin detects a change (in this case, a transition from low to high), the processor wakes up and resumes processing from the point at which it went to sleep. Then, we clean up our interrupt handling and force a restart of the processor, so it can start fresh by going through a complete system setup. Before we get to that, there are some other tests I want to perform. Turning an LED on and off is a great proof of concept, but I need to do some real work. In Figure 3, I show a relay and some other peripherals added to the original circuit. A transistor-driven relay allows us to control large loads. Beware that when the system is on, the relay represents a significant load, and unless it is turned on only briefly, is not suitable for a small battery-powered system. No change is required in the software to use a relay instead of an LED. For driving relatively low power (200 mA or less) loads, I prefer to use a pFET. 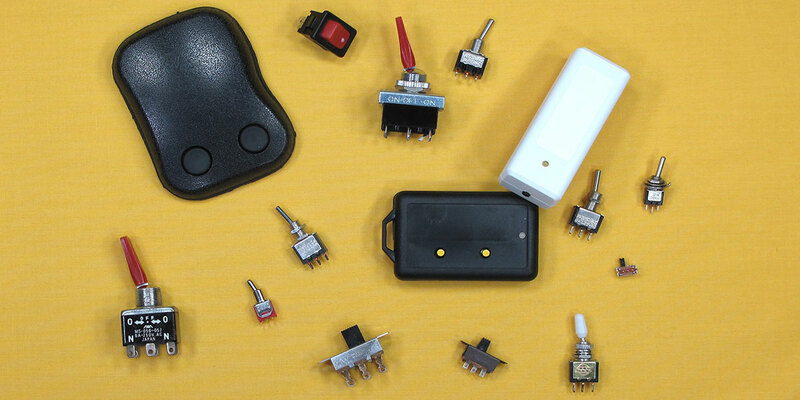 They’re cheaper than a relay, use very little space, and can have a very low voltage drop. Driving a 20 mA radio transceiver, I experienced a “diode forward voltage drop” of only 0.15V. Ordinary transistors will usually have a drop of 0.7V or more. The 2N2222 I tested had a 0.9V drop with the same 20 mA load I tested with the pFET. The reason I’m focused on low sleep currents and pushbutton activation is a wireless doorbell and alarm project I’m working on. 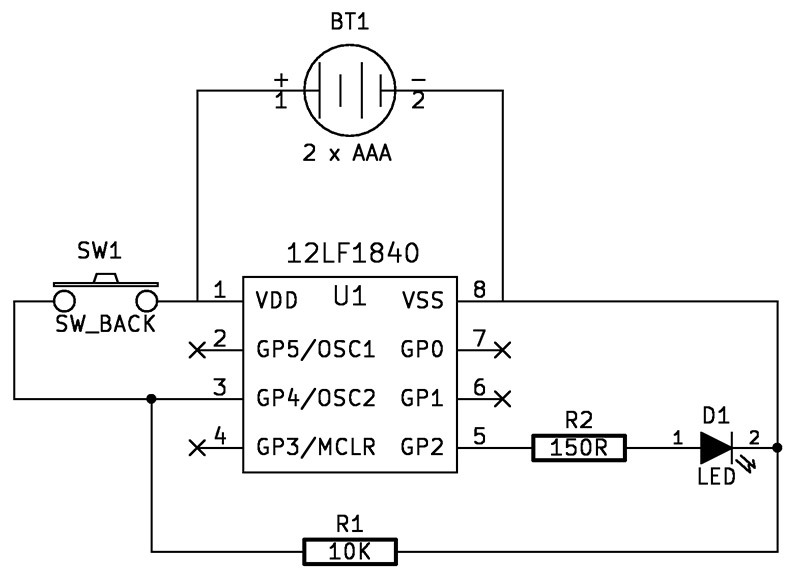 I want to be able to use a pushbutton switch or a PIR (passive infrared) sensor to trigger the radio transceiver that communicates with the base station. The radio takes a while to power up, so if you just connect the pushbutton between the battery and radio module, and then tap the button, the circuit may not be on long enough to power-up and send the signal. I need to be sure the transceiver has enough time to fully power-up, send a signal, then continue to stay on long enough to receive a confirmation signal. This, in turn, lights the doorbell button to let the user know the bell has actually been rung. The processor provides the necessary logic and timing. In this particular scenario, the pushbutton is only used to turn the system on. Once the processor has performed its tasks, it goes to sleep on its own, waiting for the next visitor. The entire package fits into a plastic single-gang junction box behind the doorbell button. When idle, the circuit draws less than 50 nA. On average, the system is powered to 20 mA once a day for only a few seconds. The batteries will easily last more than a year, which was the design target. 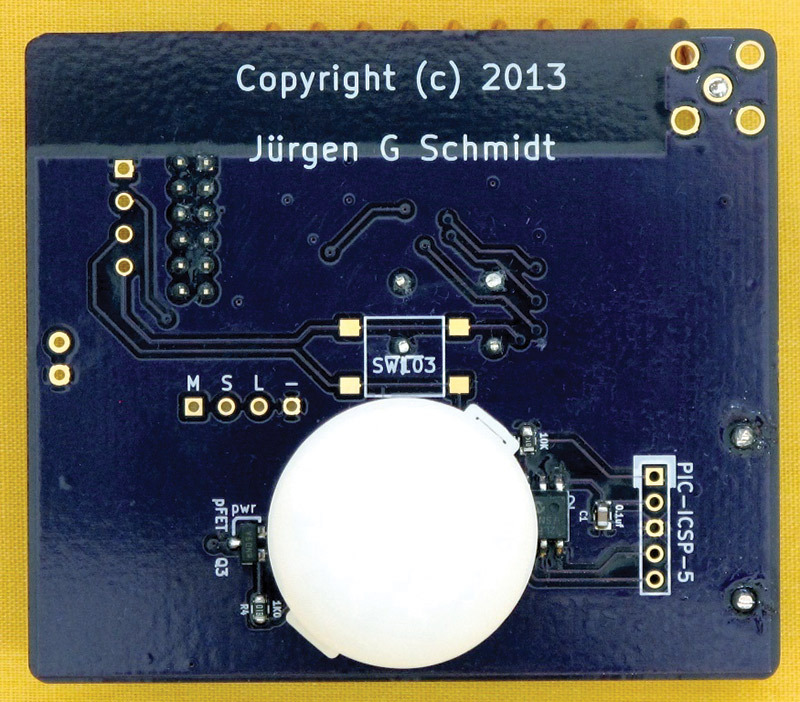 Figure 3 includes a PIR motion sensor trigger circuit for the same wireless doorbell project. I have several transmitters, and the receiving base station plays a different tone depending on which transmitter is triggered. Panasonic makes a low power PIR motion sensor that draws less than 1 uA while waiting to detect motion. When motion is detected, the signal is amplified by an NPN switching transistor that, in turn, triggers the interrupt on the processor, waking it up. In addition to driving the radio with the necessary timing, the processor has some delays built into it so the receiver isn’t constantly ringing while something is passing the motion sensor. The radio is turned off during these delays. Figures 4 and 5 show the front and back of the wireless motion sensor module. The front has the radio, antenna, and battery pack. The back has the PIR sensor, power control, and processor. This is designed to be mounted discretely in a junction box with only the sensor dome exposed. I used OSHPark (see References) to manufacture the circuit board. Assembly is done via my toaster oven reflow system. In 2009, David Jones presented the open source µCurrent, and described both the need for it and how to make it in an article in the April 2009 issue of Silicon Chip Magazine. 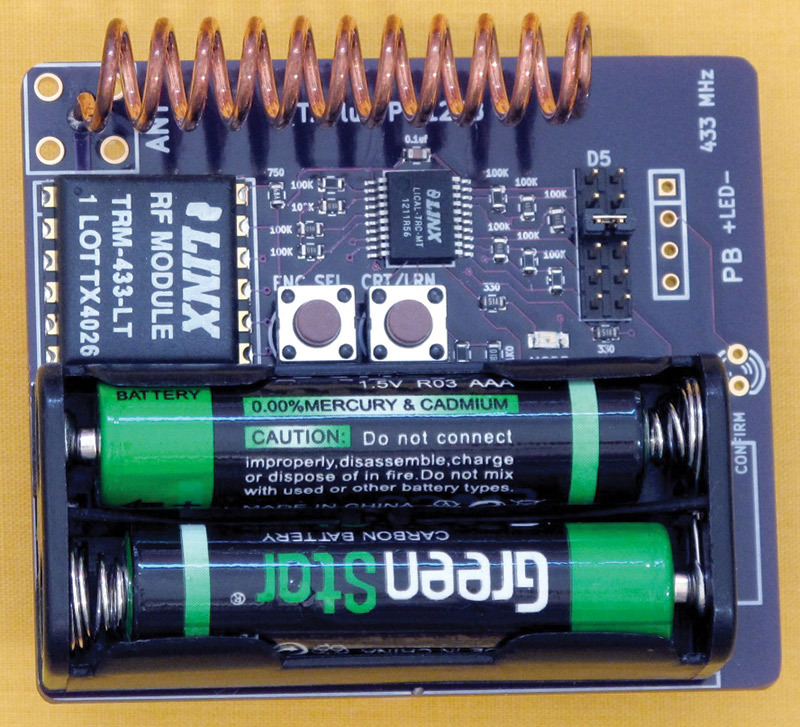 The µCurrent is a low cost (less than $100) adapter that lets you accurately measure current down to the nano-amp with any digital multimeter capable of measuring millivolts. 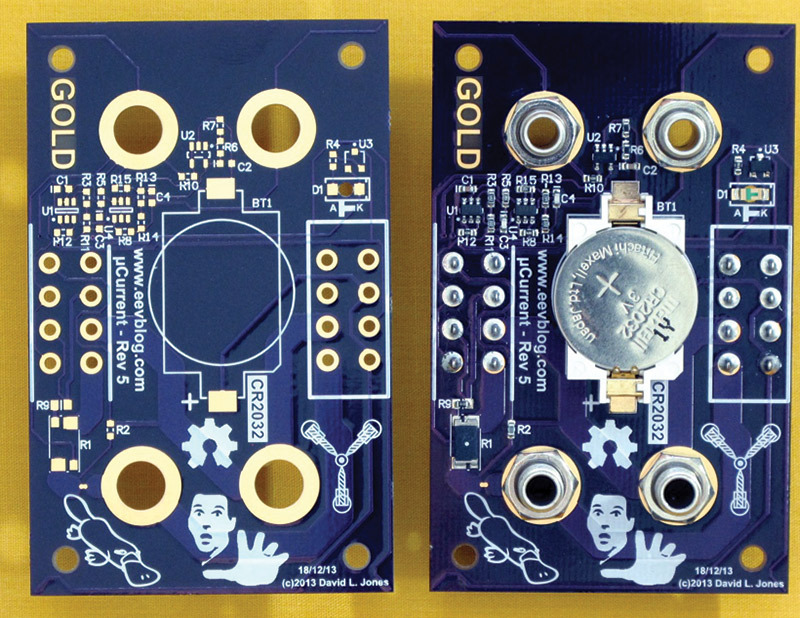 In 2013, Jones announced the version 5 µCurrent Gold and initiated a Kickstarter project to fund production, exceeding his funding goal more than ten-fold. 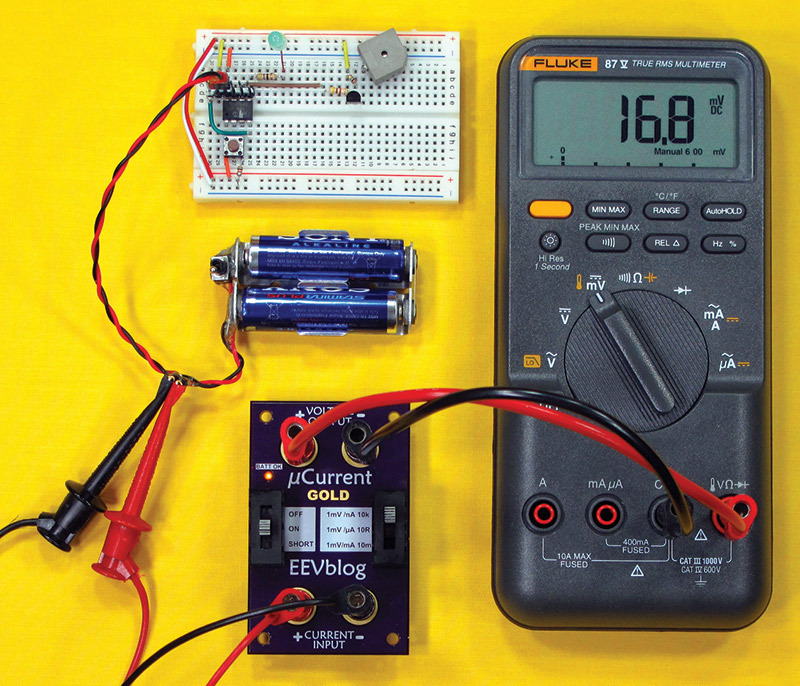 His video on the Kickstarter page does a good job of explaining why you need something like the µCurrent to measure current without impacting your circuit. He is currently in production, but it may still be a while before units are available in the US. I wasn't prepared to wait, so I downloaded the publicly available PCB manufacturing files and parts list. I made some changes to the PCB files so they would be accepted by OSHPark, and I checked with David Jones about substituting for a part that was only available in full reel quantities. All of the parts were available from Mouser Electronics. Once the boards came back, I assembled my own µCurrent and sent David Jones a donation. You can see the bare boards and my assembled µCurrent in Figures A and B. The µCurrent uses several precision op-amps and precision resistors to generate a voltage in the millivolt range that is proportional to the current being measured. The µCurrent can be seen in action back in Figure 2. The 16.8 millivolts displayed on the meter translates to a measurement of 16.8 nA for this circuit in sleep mode. I'm using a PIC12LF1840 microprocessor, and the spec sheet says the sleep mode current is 20 nA. 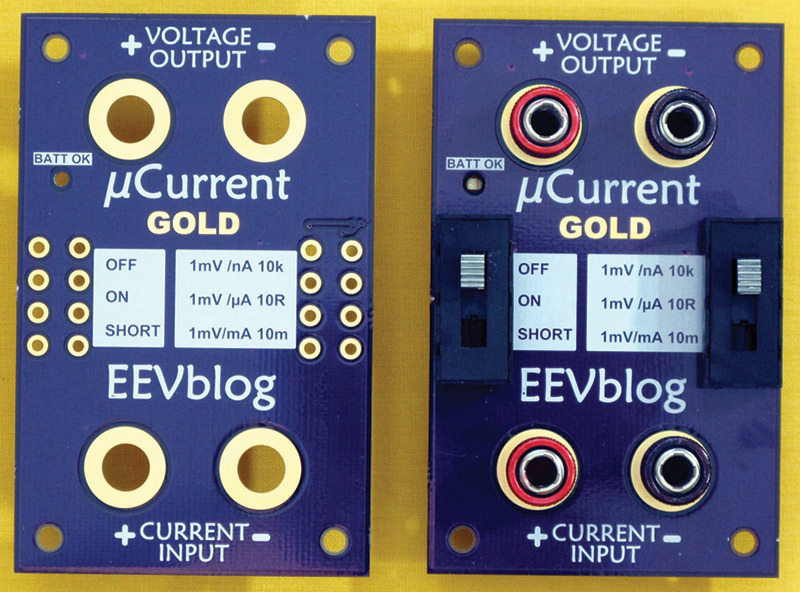 For anyone working with low currents, a tool like the µCurrent is indispensable. David Jones Video Blog — 600+ videos!